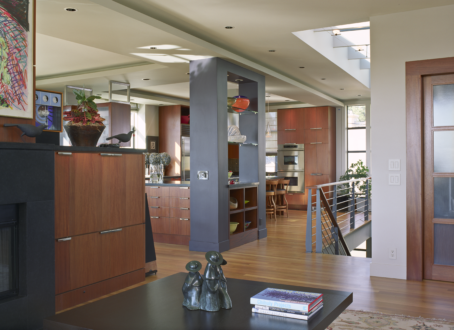 This image of cabinetry in a beautiful Kirkland home showcases the work from the sister company, Bellan Shopworks. In this project, Shopworks built casework for all rooms in the home including this beautiful image that captures the built-in entertainment center; the built-ins for the open dining area and the kitchen cabinetry. This project was highlighted in a Seattle magazine showcasing superior homes in the area.